There is a break change in IIS 7.5 on Windows 7 and Windows Server 2008 R2. The default identity for running an application pool is "ApplicationPoolIdentity". If you have a web application developed against application pools running with NETWORK SERVICE on IIS6/7, it might break after migrated to IIS 7.5 due to default application pool identity change. Launch Internet Information Services (IIS) Manager tool, in the left-hand pane of the IIS Manager tool expand the machine node, and then click on the "Application Pools" node so that the application pools display in the main window of the management tool. 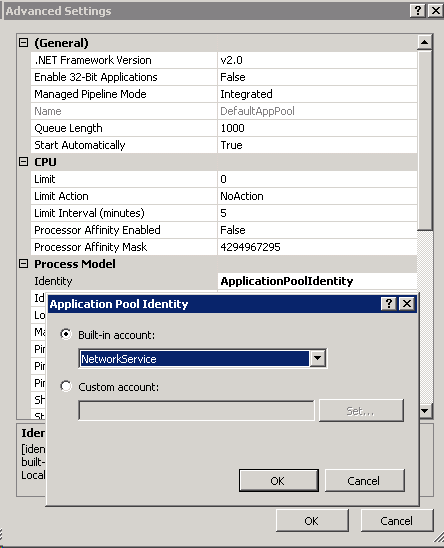 For ASP.NET 2.0/3.0/3.5 application select the "DefaultAppPool" application pool. For ASP.NET v4 select the "ASP.NET v4.0" application pool. Right-click on the selected application pool and choose "Advanced Settings"
A dialog box called "Application Pool Identity" will popup. Make sure Build in Account radio is checked and choose "Network Service" for the identity. Click "Ok" to save the change.